We are back at Cook & Brew, the Westin Singapore's specialty gastro-bar for the unveiling of new curated dishes by Chef Aaron Foster and his team. Born in Canada, Chef Aaron Foster is known for his love using pork and beef to create a range of wholesome dishes. The taste of Poutine “EH” still lingers after all this time. 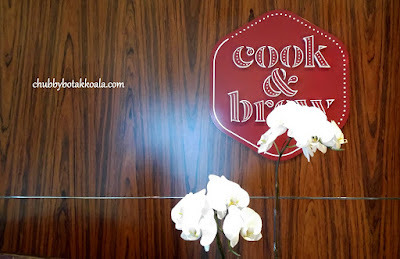 (Check out theprevious review of cook and brew here). This time around, the vegetarian has something to look forward to. Roasted Broccoli ($14). The aroma of roasted broccoli just filled the air when this dish is served. Topped with sweet pickles, chilli, sesame, honey dijon and sriracha dressing it looks like a lump of greens. It is crisp and crunchy, followed with multiple bold flavours teasing your palate. Unfortunately, my taste-buds did not agree with the sriracha. Interesting dish, but just not for me. Nem Nuớng̣ Vietnamese Charcoal Grilled Pork Sausage ($16). Inspired by his recent trip to Vietnam, Chef Aaron Foster presents his version of grilled pork sausage. It is well seasoned, nicely grilled with smoky aroma and succulent meat. Presented in Japanese mini grill, the pork sausage continues to retain its heat. The pickled vegetables is almost as close as the one you get in a Vietnamese restaurant, while the spicy watermelon is refreshing. You can dip into the chilli mix if you want more kick to the dish. Garganelli Pasta & Duck Confit ($32). It looks like a refined version of Italian Kway Chap. The duck broth is thick and robust. The Garganelli pasta is cooked to al-dente and absorbs the broth nicely. The duck just basically melts in your mouth. There is some cabbage at the bottom of the dish to balance the saltiness in this dish, while the parmesan cheese just binds all the components together. Yum Yum. Handmade Ricotta Cavatelli ($28). It is rolled individually by hands, cooked with cashew nuts, pecorino cheese, roasted pumpkins and garnished with coriander rocket pesto. The flavour of the herbs and nuts create the flavour of the dish. The handmade cavatelli has a slight pleasant chewy texture, acted as the base to absorb the herbs, nuts and cheese. More like a healthy pasta and suitable for vegetarian as well. 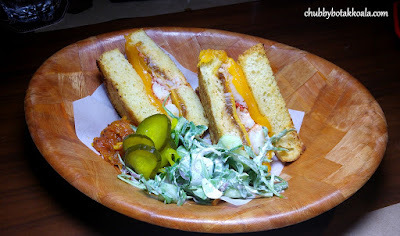 Lobster Grilled Cheese ($49) is the Cook and Brew version of lobster bun. Beautifully cooked Nova Scotia lobster, sandwiched between fried brioche. Served on the sides are Chef Foster Grandma's tomato jam, sour pickles and cucumber salad that provided refreshing and balance to the rich dish. I just wish there are more of those juicy lobster meat. Finally, the Moo Moo arrived. Beef Pot Roast ($39) and USDA 365-Day Grain Fed Striploin ($61). The beef pot roast is like a regular comforting winter dish. The melt in your mouth short ribs were slowly cooked in red wine, until the collagen breaks down and released the essence of the beef in the gravy. The cheese and mascarpone polenta deliver in flavours and is a good replacement to a regular mash potatoes. USDA 365-Day Grain Fed Striploin is just exquisite. Although it is not ribeye, the marbling on the beef is very good. Meaty, juicy and succulent. The espuma cipollini au jus provided sweet, airy foam gravy to this dish. Yum Yum. The sweet ending were Anna Olson's Steamed Carrot Cake ($14), Chocolate Raspberry & Hazelnut Crunch Cake ($15) and Caramel Butter Tart ($13). The carrot cake is sweet and dense, topped with cheese frosting. It is served with vanilla sauce and vanilla ice cream for alternate texture to the dish. Chocolate Raspberry & Hazelnut Crunch Cake is a treat for chocolate lovers. Pack with dark chocolate flavours, moist with multi layer texture with raspberries on the side to balance the dish. The ice cream complemented the cake nicely. Caramel Butter Tart is like a mini dessert tart. Crumbly crust that holds the butter fillings, accompanied blood orange sherbet and caramelized macadamia nuts for texture. I like the acidity from the sorbets and blood orange fruits, that balance the richness of the tarts. It is a good finale and clean the palate nicely. Overall, it was indeed an impressive line up to the gastro-pub offerings in Cook and Brew. The portion was generous and almost need to be rolled out like a wine barrel from the restaurant. Looking for a Gastro-pub in Marina Financial Centre Singapore, look no further than Cook & Brew. Cheers!! Thank you very much to The Westin Singapore team for hosting the dinner.